3.1 Who Wants Your Data? 6.1 What are Best Practices? 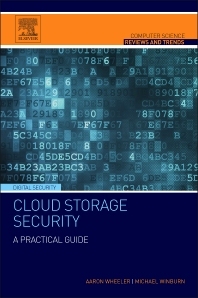 Cloud Storage Security: A Practical Guide introduces and discusses the risks associated with cloud-based data storage from a security and privacy perspective. Gain an in-depth understanding of the risks and benefits of cloud storage illustrated using a Use-Case methodology. The authors also provide a checklist that enables the user, as well as the enterprise practitioner to evaluate what security and privacy issues need to be considered when using the cloud to store personal and sensitive information. Aaron Wheeler is a Research Scientist at 3 Sigma Research and adjunct faculty at Valencia College. Previously he was a Software Engineer with Modus Operandi and Staff Research Assistant at Los Alamos National Laboratory. His interests include information security, cloud computing, ontologies and knowledge engineering, and intelligence agent applications to defensive cyber-warfare. He has presented his research at the International Conference on Artificial Intelligence, International Conference on Information and Knowledge Engineering and the International Conference on Integration of Knowledge Intensive Multi-Agent Systems and presented at workshops related to cloud computing and cloud computing and data privacy and security. He has developed a number of data security products for the US government through the Small Business Innovative Research Program. Michael Winburn founder of 3 Sigma Research an information security research organization providing state-of-the-art solutions to government and commercial organizations. Serving as Chief Scientist, he has many years of experience in research and development that includes projects conducted for the Air Force Research Laboratory, the National Science Foundation, NASA, and the Defense Advanced Research Projects Agency. He is a frequent guest speaker and panel participant at computer security conferences including IEEE, International Conference on Artificial Intelligence (ICAI), InfowarCon, the Economic Crime Investigative Institute, and other government-sponsored conferences.